BRASELTON, Ga.—Michael Shank Racing’s Olivier Pla captured the pole for the 2016 IMSA WeatherTech Sportscar Championsip Petit Le Mans season finale with a lap of 1:13.061 at 125.1 mph in the team’s Honda-powered.#60 Ligier JS P2 Friday afternoon, Sept. 30. Pla edged out Mazda driver Tristan Nunez by a healthy 0.459 of a second. Nunez managed a lap of 1:13.520 at 124.3 mph in the #55 Mazda Motorsports Prototype. Dane Cameron in the #31 Action Express Coyote-Corvette qualified third ahead of Tom Long in the second Mazda prototype. Only these three were able to lap the ten-turn, 2.54-mile Road Atlanta course within a second of Pla’s time. This is not to say that the rest of the field was slow. Of the nine prototypes entered, the #10 Wayne Taylor Racing Dallara-Corvette driven by Ricky Taylor was slowest, only 1.47 seconds off Pla’s pace. Pla told IMSA.com, “From the beginning the team has done a great job. They gave me a very competitive car and we kept improving each time. I was expecting that more or less. The other things will come tomorrow. Petit Le Mans is a ten-hour race, sole pole is more about bragging rights for the driver and crew than any advantage in the actual contest. Shank Racing has had several years of bitter misfortune, punctuated by a lucky win the 2012 Rolex 24, and will be retiring the #60 Ligier after Petit, so the team truly has nothing to lose—and if allthey win are those bragging rights, still they must seem exceptionally sweet. Competition in IMSA’s GT-Le Mans class is always fierce, but rarely does ti get closer that it did in qualifying for this year’s Petit Le Mans. The entire ten-car field lapped Road Atlanta within 0.73 of pole winner Richard Westbrook in the #67 Ford Chip Ganassi Racing Ford GT. Westbrook turned in a lap of 1:18.131 at 117 mph to take the class pole. “Honestly it was a bit messy,” Westbrook told IMSA.com. “The conditions were completely different than P4, it was a lot cooler then. “It’s so sensitive, we’ve seen before you can have a quicker car in the heat of the morning and then be slow during the heat of the day. We did the right thing on the setup and predicted it would be slower. We got the car just right. I’m just delighted. Westbrook and co-driver Ryan Briscoe are locked in a battle for the GTLM drivers’ championship with Corvette Racing drivers Oliver Gavin and Tom Milner in the #4 C7.R. Corvette Racing will win the manufacturer’s title just by taking the green flag, but Westbrook trail by eleven points. “All we can do is try and win the race. And we can put the pressure on the 4 car (Corvette). It’s a long shot, if we can just stay out front and see what happens,” Westbrook explained. A Final IMSA Victory for Viper? Jeroen Bleekemolen put the #3 Riley Motorsports Dodge Viper GT3-R on the GT-Daytona pole with a lap of 1:21.305 at 112.4 mph. It seemed fitting that this car, which will be retired from IMSA racing after Petit, should win pole on its last foray. A crowd favorite, the car saw success in its first season, winning the championship, but still fell victim to corporate downsizing when Fiat took over Chrysler Dodge. Car owner and co-driver Ben Keating basically campaigned the car out of pocket, through his company ViperExchange.com and with support from Gas Money Garages. Bleekemolen beat out a pair of Porsches to take the pole. Park Place Porsche driver Matthew McMurry was 36 hundredths slower than Bleekemolen in his #73 911 GT3 R. Mario Farnbacher in the #23 Team Seattle/Alex Job Heart of Racing GT3-R was a further .133 back. PR1/Mathiasen Motorsports driver Robert Alon topped the Prototype Challenge class with a lap of 1:16.411 at 119.6 mph in the team’s #52 Oreca-Chevrolet, beating out Alex Popow in the #8 Starworks Oreca and Johnny Mowlem in the similar #20 BAR1 Motorsports Car. “Honestly I think we had a really good car,” Alon said. “It felt good. All I had to do was put my head down and do what I had to do and the car did the rest. Popow and co-driver Renge Vander Zande lead the PC driver’s championship with 329 points each. Alon trails by ten. 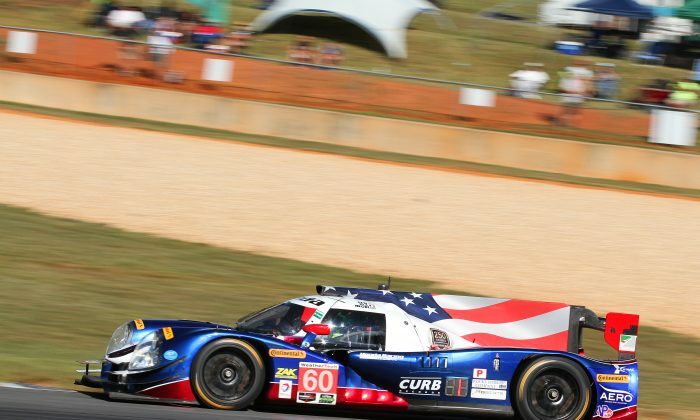 Petit Le Mans at Road Atlanta, takes the green flag at 11:10 a.m. on Saturday, Oct. 1. The race will be broadcast on Fox Go, IMSA TV at IMSA.com, and in part on Fox Sports 1 and Fox Sports 2. Check local listings for more details. Live Timing and Scoring as well as audio coverage by IMSA radio will be available at IMSA.com.